This article is about the current Northern train operating company. For the former train operating company, see Northern Rail (Serco-Abellio). Northern, the trading name of Arriva Rail North is the primary train operator in Northern England. A subsidiary of Arriva UK Trains, it began operating the Northern franchise on 1 April 2016. Northern operates more stations than any other train operating company in the United Kingdom. In August 2014, the Department for Transport announced that Abellio, Arriva and Govia had been shortlisted to bid for the next Northern franchise. Northern took over all the services operated by Northern Rail (also branded Northern) on 1 April 2016 and on the same date, services between Manchester Airport and Blackpool North, Manchester Airport and Barrow in Furness and Oxenholme to Windermere from First TransPennine Express. Northern took over responsibility for all the stations managed by Northern Rail, as well as Arnside, Barrow-in-Furness, Birchwood, Burneside, Carnforth, Grange-over-Sands, Kendal, Staveley, Ulverston, Warrington Central and Windermere from First TransPennine Express. Northern will staff some currently unstaffed stations. The first stations to be staffed will be Baildon and Ben Rhydding, both in West Yorkshire. Northern has committed to introducing free Wi-Fi on trains, and new ticketing options including the ability for customers to print their own tickets. Arriva will provide new services across the North of England. In October 2017, the Cleethorpes to Barton-on-Humber service will transfer to East Midlands Trains. The transfer will include Barrow Haven, Barton upon Humber, Goxhill, Great Coates, Grimsby Docks, Habrough, Healing, New Clee, New Holland, Stallingborough, Thornton Abbey and Ulceby stations. From December 2019, Northern will operate a network of twelve Northern Connect interurban express services, eleven of these will be operated by brand new Class 195 diesel multiple units and Class 331 electric multiple units, whilst the Middlesbrough to Carlisle via Newcastle route will be operated by refurbished Class 158 units. Places that will be served by Northern Connect routes include Bradford, Chester, Halifax, Leeds, Liverpool, Manchester, Nottingham, Newcastle, Preston, Sheffield and York. The routes transferred from the TransPennine franchise will also be part of the Northern Connect network. Northern inherited the rolling stock operated by Northern Rail, namely Class 142, 144, 150, 153, 155, 156 and 158 diesel multiple units and Class 319, 321, 322 and 333 electric multiple units. To operate services transferred from the TransPennine Express franchise, 185s are sublet from that franchise to Northern. Class 37/4 locomotives and Mark 2 carriages are hired from Direct Rail Services until 2017 for Cumbrian Coast Line services. Northern will take delivery of 98 Class 195 and Class 331 trains built in Spain by CAF between 2018 and 2020. They will be a mix of two and three car diesel multiple units and three and four car electric multiple units all based on the Civity UK platform. The units will primarily be deployed on Northern Connect regional express services. A total of 51 diesel powered units will be cascaded to Northern from the Abellio ScotRail, London Midland and Great Western Railway train operating companies after the Edinburgh to Glasgow and Great Western Main Line electrification projects are completed. Twelve Class 319s will be cascaded from Govia Thameslink Railway to operate electrified services in the North West allowing Class 142 and Class 144 units to be replaced as well as the Class 37 hauled Mark 2 carriages. The Class 323 units will be returned to leasing company Porterbrook at the end of 2018 when their leases expire. 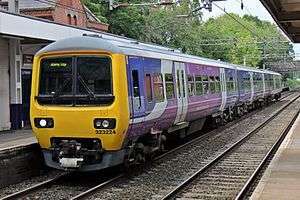 Between July 2016 and December 2017 Northern will operate a peak morning working between Bradford and Leeds using a Class 180 set hired from Grand Central Railway releasing other DMUs to cover the reduction in the number of units available to hire from TransPennine Express. An additional 18 two carriage DMUs are due to join the fleet by December 2022. Northern's fleet is maintained at Allerton, Heaton, Newton Heath and Neville Hill depots. Train Crew Depots are located at; Leeds, York, Newcastle, Darlington (Driver only), Middlesbrough (guard only), Carlisle, Workington, Blackpool North, Liverpool Lime Street, Wigan Wallgate, Manchester Victoria, Manchester Piccadilly, Buxton, Sheffield, Skipton, Huddersfield, Harrogate, Hull Paragon, Barrow-in-Furness and Doncaster. ↑ Lea, Robert (21 May 2016). "Arriva faces northern exposure amid franchise victory enquiry". The Times (71916). p. 51. ↑ Clinnick, Richard (17 May 2015). "Arriva faces possible investigation over competition concerns". Rail. Retrieved 21 May 2016. ↑ "Proud to be Northern - April 2016". ↑ "Arriva chosen to run and expand Northern franchise from next year". Rail Technology Magazine. 9 December 2015. Retrieved 9 December 2015. ↑ "Massive boost to rail services brings Northern Powerhouse to life". ↑ "Northern launches new business regions - Northern". ↑ "Loco-hauled services to return to the Cumbrian coast". Railway Herald. 8 January 2015. 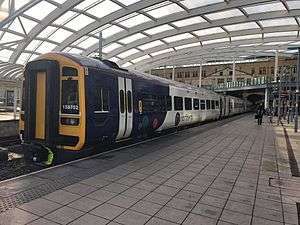 ↑ "Bigger Trains and Changes Ahead For Cumbria's Coastal Rail Route" (Press release). Northern Rail. 18 May 2015. ↑ "Electrification in the North - Network Rail". ↑ "Arriva signs £490m rolling stock contract to replace Northern's Pacers". Rail Technology Magazine. 22 January 2016. Retrieved 14 March 2016. ↑ Barrow, Keith (22 January 2016). "CAF to supply 98 trains for Britain's Northern franchise". International Railway Journal. Retrieved 26 March 2016. ↑ Barrow, Keith (11 December 2015). "Arriva confirms Northern rolling stock plans". International Railway Journal. Retrieved 26 March 2016. ↑ "Scotrail franchise agreement" (PDF). Transport Scotland. Retrieved 26 March 2016. ↑ "Franchise Agreement - Great Western" (PDF). gov.uk. 22 March 2015. Retrieved 26 March 2016. ↑ "Northern Franchise Improvements". Department for Transport. Retrieved 26 March 2016. 1 2 3 4 5 6 "Northern Franchise Agreement" (PDF). Gov.uk. Gov.uk. Retrieved 14 July 2016. ↑ "Network Rail - Page not found" (PDF). ↑ "Regional Passenger Trains | Angel Trains". www.angeltrains.co.uk. Retrieved 13 August 2016. Wikimedia Commons has media related to Arriva Rail North.